A new electric bus service utilizing wireless charging systems will soon be launching in Berlin. The service — dubbed Berliner Verkehrsbetriebe (BVB) — is currently set to start in 2015, and will make use of electric buses from Solaris. With regard to the specifics of the service, there will be four buses initially, running on a 6.1-kilometer (3.8-mile) pilot project line between Zoologischer Garten (Hertzallee) and Station Suedkreuz Station. The electric buses will utilize the PRIMOVE inductive wireless charging system from Bombardier, with the power supply equipment kept on the bus coming from Vossloh Kiepe. “The PRIMOVE inductive charging system system is designed with an output of 200 kW, and uses an undercarriage pantograph-like mechanism lowered above an in-ground charging pad. At that transfer rate, only a few minutes of charging time are required at the respective endpoints of the line,” according to Green Car Congress. It certainly seems that the approach could be successful, owing to the time saved via the wireless charging, but obviously high costs could erase that advantage. And the pilot project does have a fair bit of cost to it — it will reportedly receive about €2.3 million ($2.9 million) in federal funding from the government there. So there is certainly a question there of just how economical such a technology can be when put into practice. People love the idea, though, and you could say that the arguments made for the technology are convincing. Aside from the time savings (which are worth something), there’s no need for overhead wires and no space on the sidewalk or in the road is needed for charging stations. Time will tell. The project is currently being supported by the Technical University of Berlin. This is certainly not the first trial of a wirelessly charging electric bus, though. Utah-based electric bus company WAVE is testing wireless buses in several US cities, there’s a wireless electric bus trial underway in Milton Keynes (in the UK), active wireless charging electric bus technology developed by the Advanced Institute of Science and Technology (KAIST) in South Korea is being tested there, and I imagine other such trials are in place elsewhere. 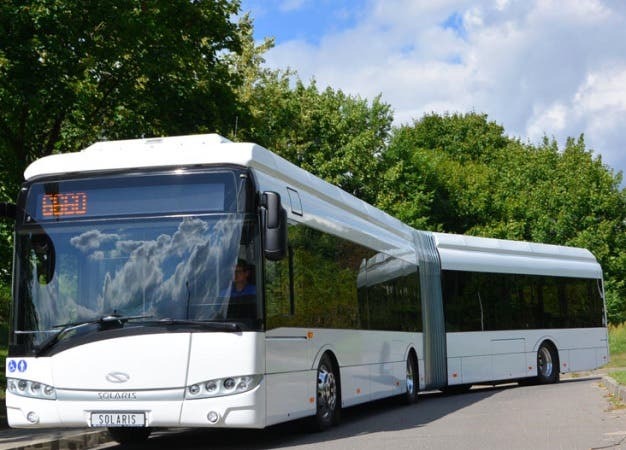 Then there’s also a competing flash charging electric bus technology developed by ABB as well as BYD’s long-range electric bus option. Needless to say, there are a lot of approaches out there, but one way or another, it seems the future of buses is going to be electric.